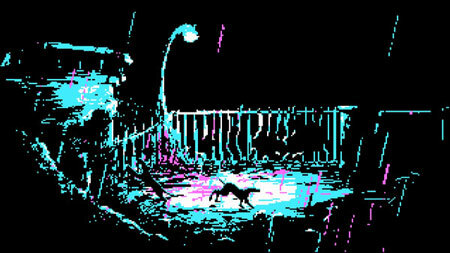 The Eternal Castle Remastered is a post-apocalyptic adventure game with CGA graphics from Playsaurus. It is a gorgeous game that makes the most of a very limited color palette to create stunning environments. You will be thrown into a strange world and forced to make a choice between two protagonists. Figure things out for yourself in an environment that quickly presents itself as hostile. After a simple MS Dos style prologue, your adventure will start. It is more like a side-scroller platformer. The game will instruct you how to control your character with the keyboard. Watch out for those giant dropping truck or other things, you will die if it hit you. You will meet some wolf-like animals and strange enemies. Sometimes you need to be smart, cutting the rope will make things easier. It is really a cool game with unique graphics. You may enjoy the amazing Kungfu of the protagonist, but do not forget using your gun. The game features 20 different levels across 5 unique worlds, each featuring bosses to defeat. The game also features 10 different weapons and 10 different abilities to unlock. Collect all 4 Gliders to power up your ship. Find all missing Fragments to get back home. This entry was posted in PC Games, Walkthrough and tagged The Eternal Castle Remastered Cheats, The Eternal Castle Remastered Gameplay, The Eternal Castle Remastered Guide, The Eternal Castle Remastered Strategy, The Eternal Castle Remastered Walkthrough by Marvin. Bookmark the permalink.